We’ve been gardening for a few years, which means at the end of the season, we have some veggies to can. This year, our tomatoes didn’t do very well, so we had a ton of green tomatoes to pick before the first frost. Jon wanted to bring them in to see if they’d ripen, but I had other plans. I researched several recipes for pickled green tomatoes and landed on one that struck my fancy. 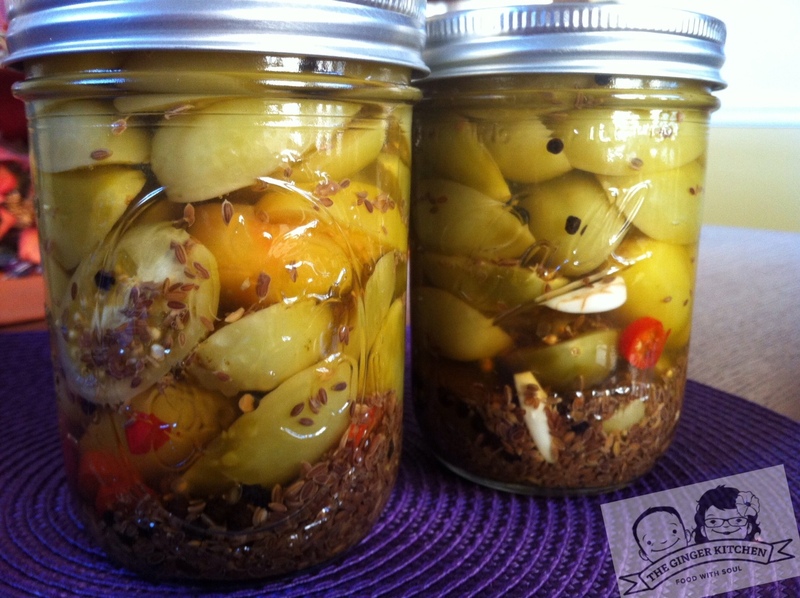 I love pickling things. Earlier this year I experimented with pickled sweet okra and loved it. I have a feeling I will love this when we finally crack open the cans. Have you been canning this year? I’d love to hear about your experience. Share them with us! Sterilize your canning jars in boiling water. Once complete, add garlic, dill seeds and peppercorns to the jar. Thoroughly wash the tomatoes and slice them in halves or quarters. Cram them into the jar, leaving about 1/2 inch to 3/4 inch of space at the top. Make the brine by combining the vinegar, water and salt in a sauce pan, Bring to a boil and stir until salt is dissolved. Pour the hot brine over the tomatoes to within 1/4 inch of the top. Wipe the jar top, put the lid on and tighten. Age for at least 2 days.